Inflammatory disorders such as ulcerative colitis, inflammatory bowel disease, and rheumatoid arthritis may respond to the anti-inflammatory effects of Omega 3 essential fatty acids. Cardiovascular problems, blood clots, hypertension and cholesterol profile. HDL cholesterol rises with Omega 3 fish oils, providing a better cholesterol profile. 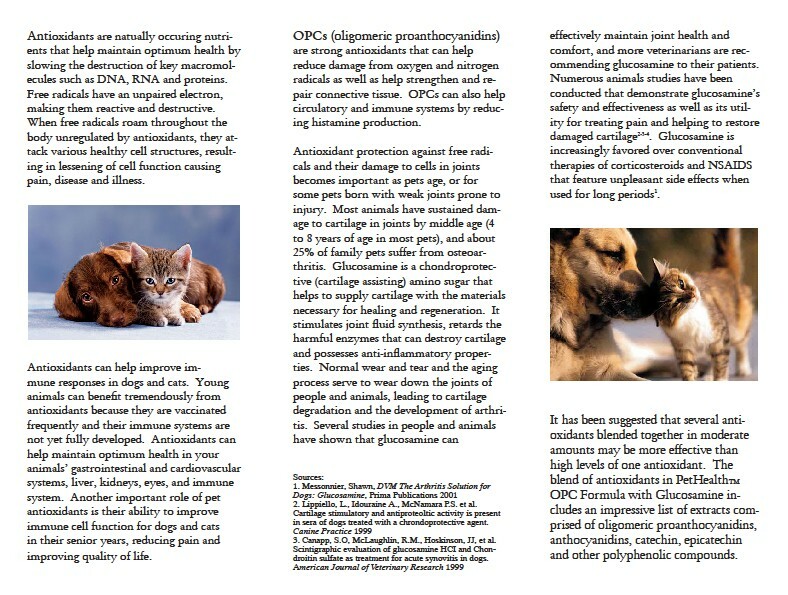 IMO the best overall supplement for any pet is PetHealth by Market America. My geriatric retriever-mix Billy gets his PetHealth and one Omega III capsule in his food every day and he's doing great! He is afflicted with congenital degenerative arthritis and Hip Displasia, and for a 90# dog, 13 years is very old. When he went in for a dental last year, my vet said he's in incredible health, his bloodwork is fantastic for a dog his age. He barely ever even limps, but when the weather is bad or he's overactive, I add one enteric coated aspirin to his regimen per Dr's advice. I thank PetHealth for keeping him fit and vibrant. 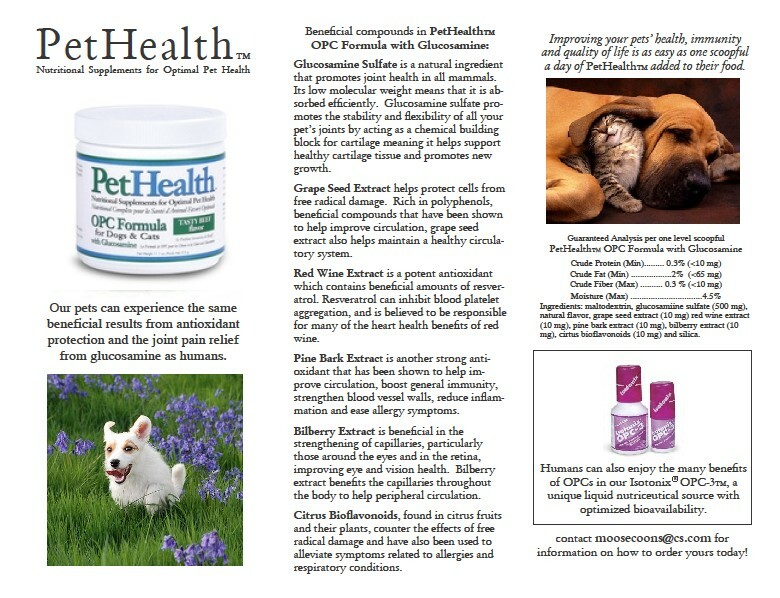 I don't just recommend PetHealth because I sell it, I sell it because I love what it does! I've been taking the human form of OPC3 for many years now and know firsthand the benefits this product offers. Add in the glucosamine for joint health and you've got one incredible supplement for your critters! It also does wonders for the coat and texture of my show cats, and boosts everyone's immunity in the house. I never want to be without this product! I've heard good things about MSM, though I haven't found the need to try it. MSM (Methylsulfonylmethane) is a naturally occuring sulfur compound found in every cell of the body. It has a vitamin-like normalizing influence on body functions. MSM is considered a potentiator of most vitamins and other nutrients, such as vitamin C, Coenzyme Q10, all B vitamins, Vitamin A, D & E, amino acids, selenium, calcium, magnesium and many others. MSM improves the cellular uptake of these nutrients, and prolongs their lives. The body can better utilize the nutrients, and taking dietary supplements is more efficient. Supplementing the diet with additional sulfur ensures the body’s ability to synthesize collagen for connective tissue health, maintain membrane flexibility and promote cell regeneration. MSM is a strong antioxidant, capable of binding and inactivating free radicals. Pets who suffer from arthritis often benefit greatly from dog MSM supplements. Several studies have shown, that supplementation of MSM, significantly reduced joint degeneration and inflammation. MSM detoxifies the body and increases circulation.